For Halloween this year, my team decided to show great office synergy by coordinating our costumes. We held a secret ballot to choose which theme to roll with for October 31st. And the winner by a land slide was Bomberman. While everyone else kept their papier-mâché heads intact, I was a bumbling idiot as usual and dropped mine on the floor. Luckily, the damage was minor and all-mighty duct tape came into play to help fix what my butter fingers could not. Thanks, duct tape. The moral of the story is don’t give me nice fragile things because I’m clumsy. With October over and gone, it’s time to buckle up for winter. When I think winter, I think of tons of blankets and soup. I don’t think of snow though because I’m from California and we don’t have an abundance of snow. Soup is tasty, but let’s make it tastier by adding some meatbombs. Yes, meatbombs. We’re gonna roll like Bomberman and start throwing bombs into everything. Total prep time will be about ~30 minutes. Total cook time will be about 1 hour and 10 minutes. This recipe will serve 4- 6 people. Skin the sweet potatoes with a peeler. Chop sweet potatoes and kale. Combine chicken broth and water in a pot and set to boil. Place sweet potatoes and kale in the pot. Reduce to medium and let simmer. Combine salt, pepper, oregano, parmesan, onion, worcestershire, and garlic with the ground beef. Add in egg and bread crumbs. 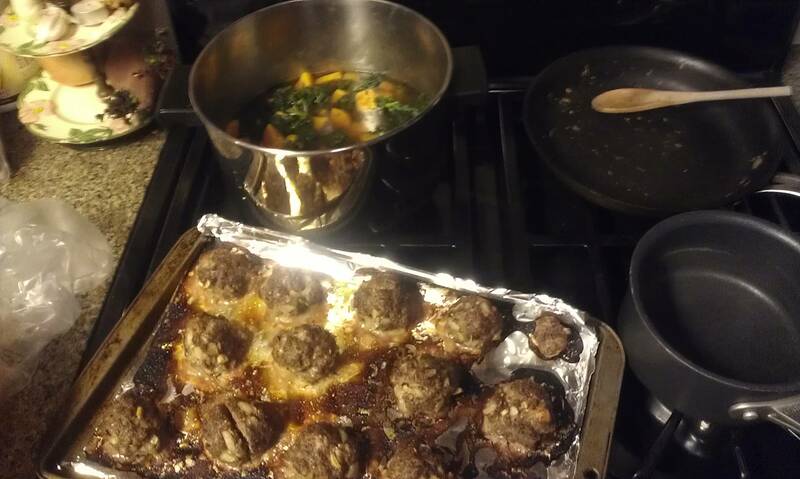 Place in a baking dish and drizzle olive oil over the meatballs. 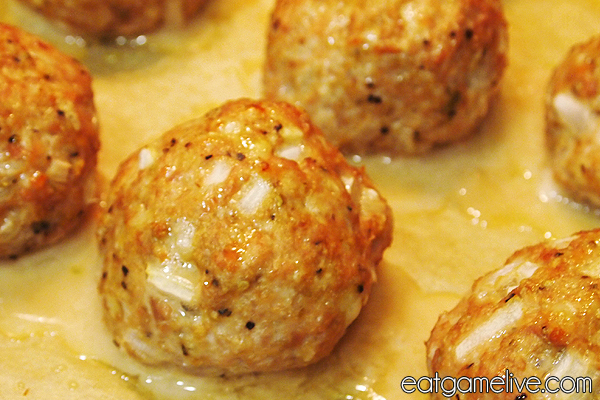 Remove meatballs from the oven and let cool for 5 minutes. 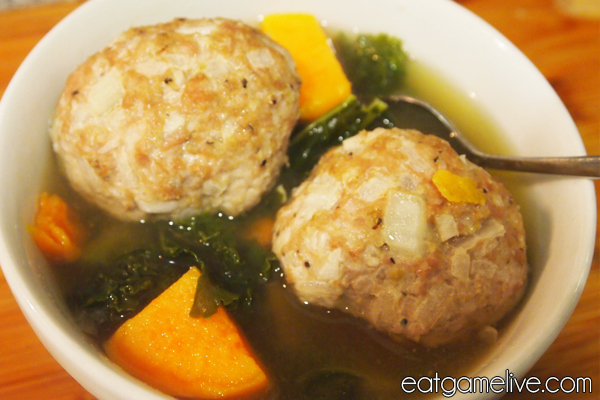 Place meatballs in the soup. And now you’ve got tasty soup! GG WP. Unfortunately, if you’re rocking a big ol’ Bomberman head, it’s going to be quite difficult to enjoy soup — especially ones that contain meatbombs. 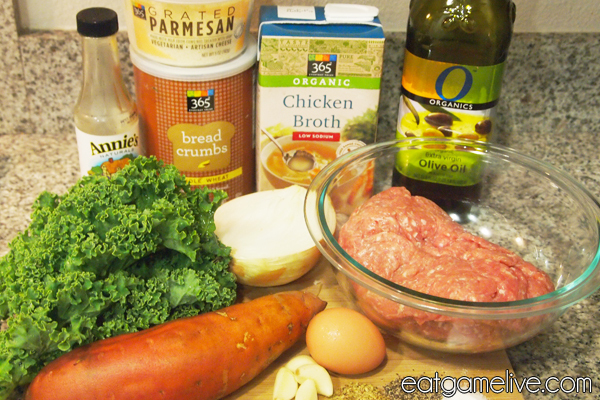 This entry was posted in bomberman, soup and tagged bomberman, kale, meatball, soup, sweet potato by admin. Bookmark the permalink. 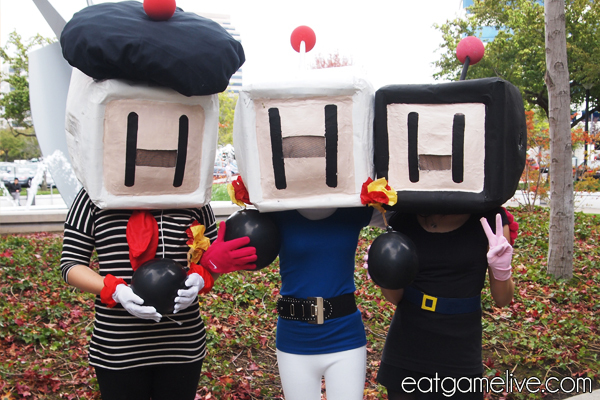 Pls share how to make the bomberman heads!!! 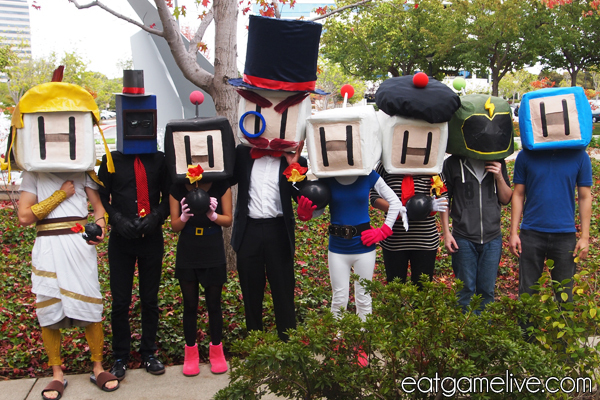 The actual artist behind the bomberman heads is writing a blog about them. Complete with pictures and detailed instructions! I’ll post the link to the blog once he’s done writing it. What do you do with the 1 tbsp of Worcestershire? I put it with the meatballs, I’m about to find out how it tastes! I cooked them for 35min on 385deg. Woohoo! Looks delicious. Good job! Did the artist that made the bomberman heads ever write the blog about how to make them? No, I don’t think he had a chance to. But basically, it was paper mache over inflatable dice.